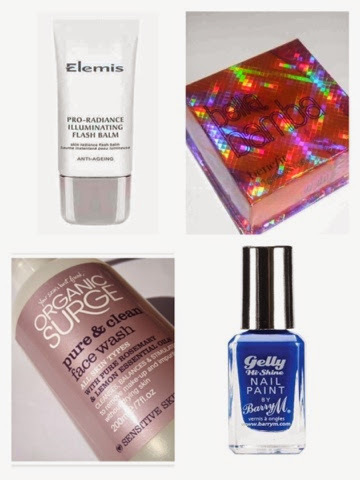 I seem to have ran out of quite a few products that I really enjoyed using but just haven't got round to repurchasing so I though I would share with you my 'Must Repurchase' beauty list! 1. Elemis Pro-Radiance Illuminatin Flash Balm RRP £33.00 50ml - I have raved about this product many times before. I wouldn't usually splash out on this much on face creams as my usual favourites, Balance Me, I find are really reasonably priced for the quality, however, this Elemis balm really does give my skin a 'pick me up' any time I am run down or under the weather, 50ml will last me a long long time so it's well worth the investment. 2. Benefit Bella Bamba Box 'O Powder RRP £27.50 - Again I wouldn't usually splash out this much on blushers as my current favourite is Sleek blushers which cost a fraction of the price however I swatched Bella Bamba at a Benefit counter again and fell back in love! You can see my full review HERE. 3. Organic Surge Pure & Clean Face Wash RRP £5.99 for 200ml - This face wash is just perfect for my oily skin and 200ml lasts for such a long time, you can read my full review HERE. 4. Barry M Gelly Nail Polishes RRP £3.99 - A few weeks a go I bought my first ever Barry M Gelly polish and it has to be one of the best polishes I have used in a long long time, and at £3.99 per bottle they are a complete bargain, I definitely want to stock up on some more! What is on your 'Must Repurchase' list?